So what does “Old” in “Old Vine” really mean? While on a recent tasting trip, we were in the Alfaro Family Vineyards tasting room, a winery in the Santa Cruz Mountains and the subject of Old Vine grapes arose with another couple with whom we had struck up a conversation. After agreeing that Old Vine was an ambiguous term, one of our new found drinking buddies suggested that we blog about it. I suppose I should try and be more creative and come up with my own topics, but this seemed like a good one and, finding really good blog topics can be difficult, so I have no problem tapping into others’ creativity! Check the dictionary to see if one of the definitions of “Old” triggers an epiphany. Nope, no epiphany other than realizing that was a total waste of time. Man’s best friend (no, not the remote control) lives anywhere between 10 to 15 years. It’s pretty easy to tell when a dog is getting old. They get gray, begin to limp, and pee on the floor – not much help there. Humans share many of the same symptoms as dogs but add a few colorful ones like repeating themselves constantly and driving 45 MPH on the freeway. The difference is that it happens to humans much later – still not too much to work with. Grapevines on the other hand can live to be hundreds of years old (there are Albarino vines in Spain that are believed to be over 200 years old). They don’t limp, don’t really pee much, and to date, I’ve never seen one driving on the freeway… not much help here either. After wasting a few more minutes trying to come up with a meaningful definition of “Old” the only real alternative was to go back to science and look at grape vine physiology. Somewhere between 30 and 40 years of age, most grape vines begin to produce fewer grapes (let’s call it “vinapause” for lack of a better term) so the remaining nutrients are channeled into a smaller number of berries producing more concentrated flavors. These “flavor bombs” are prized by winemakers. The problem is the yields of the vines drop so it’s harder to keep the vineyard economically viable to farm and harvest the crop. They are often ripped out and replanted. By the time a vine has matured to roughly double it’s peak producing age, crops can decrease by as much as 50%. However, for those vineyard owners who embrace what an old vine can produce, the rewards are worth the trouble. 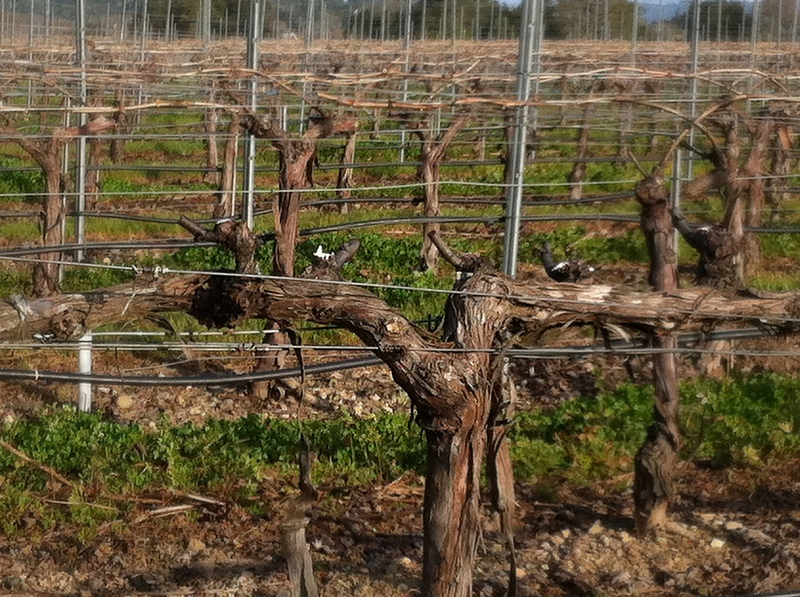 As vines mature, the shoots begin to move further out from the main trunk and so receive less nutrients. Coupled with the decreasing efficiency of the root system, the production drops. However, what they do produce is intense, and in this day and age of extracted California wines, when the goal of many winemakers is to club your taste buds into submission, “intense” is usually perceived as a good thing. Wine marketers, never one to let something as trivial as fact stand in their way, have taken to designating younger and younger wines as “old vine.” Of course, producers that actually use fruit from old vines have decided that these younger wines have intruded on their territory and have gone on to create other terminology such as “Ancient Vines.” I’ve searched a number of sources to see if anyone has tried anything even older such as “Decrepit Vine”, “Fossilized Vine”, or “Jurassic Vine.” So far no takers, but at some point I’m sure some one else will decide ancient just isn’t old enough and will come up with something else. Absolutely nothing will get done for at least 10 years, and then when it finally does, it will be both outdated and wrong. Anyone reading the government notice has a guaranteed cure for insomnia. If you do want to cure your sleep disorder, you can read the Old Vine notice on their website. With a regulatory definition clearly centuries off and marketers free to create their own colorful definitions, the only place left to turn are the actual winemakers and vineyard managers themselves. Surprisingly there is some agreement among those who nurture old vines. 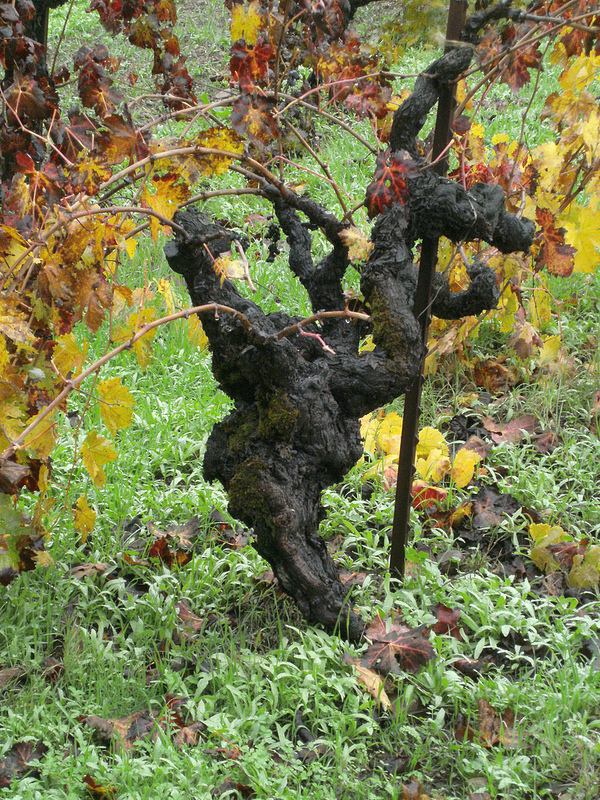 Winemakers from Ravenswood, Ridge Vineyards, and Fanucchi Vineyards agree that wines designated as “Old Vine” should come from plants at least 50 years old. Ravenswood and Fanucchi also agree that ancient vines should be at least 80 years old. Unfortunately, just when we thought things were starting to make sense, here comes modern science to throw us a twist. 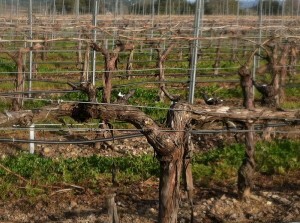 Many California winemakers are now practicing a method of pruning called “Cordon Renewal”* which allows vineyard managers to keep older vines more productive by selectively pruning the cordons closer to the trunk (for those of us amateurs, cordons are the big branches that come off the main trunk). Using this method, vineyard managers cut individual cordons back closer to the main trunk and then during the next year, choose a new shoot to form into a new cordon which places the grapes closer to the trunk and their source of nutrients. It’s kind of like plastic surgery for vines – a little nip here, tuck there, a couple silicon implants, and the illusion of youth is created. While cordon renewal won’t keep vines “young” indefinitely it will extend their productive period. So what does this mean for wine drinkers who are looking for intense flavors from gnarled old vines that had to struggle to produce their meager bounty, but instead get wines made from artificial youth? No one is quite sure yet. If we hear any more, we’ll post another blog, but for now, if your label actually says the age of the vine, odds are you are pretty safe assuming that the Old Vine vintage you are craving won’t be masquerading as a mid-life pretender. If you are at a winery and you see vines that look naturally formed instead of uniformly structured and the winery calls them old vine, you likely have the real old vines rather than older vines than have been renewed. If you are interested in drinking old vine wines, go to the winery’s web site and check out the tasting notes for the wine or if you have the bottle, look on it and see if they state how old the vines are. If they don’t, odds are they’re probably made from something closer to mid-life crisis or pre-vinaopausal vines. However, if the winery explicitly states the age of the vines from which the wine was made, and that age is more than 50 years, then you have the real stuff. If you are at the winery, look at the vines to see if they look unkempt like in the 1st picture or well manicured like the 2nd one. If they are manicured, they probably aren’t really old vines. *Thanks to Dave Moulton at Burrell School Winery for providing additional information without resorting to excessive laughter and pointing due to some occasionally dumb questions. Santa Cruz wine tasting an hour from S.F.